Planning a funeral is never easy. We have provided the following information with the goal of making a difficult time much easier for you and your family. Our staff is always here to guide and assist you, so please do not hesitate to contact us with questions. We are here to help you in any way we can. If possible bring a larger picture, we can reduce it if needed, but they are hard to blow up. Several are better than one. Used for newspaper, printing, hair dresser and as a guide for our work. Formal pictures, as well as snapshots, are acceptable. If you bring several, we will help you choose the best one. We do not charge a fee for assisting you with claims. Certain policies may be assigned to the funeral home directly, if you so wish. This short phrase sums up our mission. We are committed to provide you with a funeral experience that honors the memory of your loved one's life. What better way is there to share the person you knew and loved with others? Take a moment to reflect on the questions below. They can help you organize your thoughts and allow you to plan a more personal and meaningful ceremony. Think of five words that describe him. What traits did you admire most? Did he ever give you any words of wisdom? What relationships were important to her? Other than family, who will be affected by her death? Who had the most influence on her life? What did he do for fun when he was younger? In later years, how did he enjoy spending his free time? What type of things gave him pleasure? What things did she Learn? What accomplishments made her proudest? Was she a member of any clubs or organizations? What kind of Legacy did his life represent? How would he want to be remembered? What stories would he want passed on to future generations? What five objects could you collect that capture what he was about? In the past, the obituary was used just as an announcement of a death - just the facts. Today, they are increasingly used as an opportunity to reflect on a life well lived and how that life made a difference. This is extremely helpful to those unable to attend the services, as the obituary may be the only opportunity they have to reflect on the life of a relative, friend or colleague who has died. Our funeral home will provide you with full assistance in composing the obituary. However, for some, the process of writing an obituary is a special opportunity to say goodbye. It can be a wonderful tribute that gives us all a sense of who the person was and what they meant to those who knew and loved them. Though there are basic guidelines for writing an obituary, there are no hard and fast rules. The lead paragraph of an obituary includes the name and address, including any past addresses where the person had community ties. The date and cause of death may also be included in this section at the discretion of the writer. This section provides the time, date and location of any services being held, including the location of the final interment (cemetery or mausoleum). The obituary may also contain the locations involved with the scattering of ashes in case of a cremation. Next, if appropriate, some important facts about the person's life may be included. Occupations, memberships, community service, education and military service are typical examples. This section could also contain information about hobbies and favorite activities. The list of surviving family members usually includes the names of spouses, parents, children and siblings along with their spouses and cities of residence. However, the names of grandchildren, other close relatives and special friends may also be included. Some families provide the option of making charitable donations on behalf of the deceased in lieu of sending cards or flowers. In these situations, the address of the charity is necessary for contributors. Jonathon Q. Public, of Johnsonville, Idaho, died January 14, 2001, at the age of 83. A service of Christian burial will be held at 3 p.m. on April 11, 2000 at The church of the Savior, 2121 S. Spring, Johnsonville, Idaho. Born September 26, 1922 in Arcadia, KS, he was the third son of the late Andrew J. Public and the late Phobe Public (Abner). Jonathon lived most of his life in Johnsonville; he was an employee of Jillings International for 39 years. An active member of the local Lions club, Johnson served aboard submarines during World War II. Mr. Public is survived by his wife of 53 years, Jackie (nee Carver); his son Bill; and his daughter Margie of Johnsonville, Mr. JPublic is also survived by five grandchildren: John, Betty, James, Turner and William. We will obtain certified copies of the death certificate for you from the state health department. In Missouri the current charge is $13 for the first copy, $10 for each additional copy. Our funeral home completes a form provided by the Social Security Administration which is usually accepted as proof of death. Inquire about eligibility for Survivors Benefits. Our funeral home will assist you with the applications for a flag, a veteran's grave marker and burial benefits. Our funeral home provides insurance claim filing services FREE OF CHARGE. Contact all life insurance companies for claim forms and file claims. Check for accidental death benefits on all insurance policies. Check for life insurance benefits on loans and credit cards. Check named beneficiaries on all of your insurance policies and change if necessary. Check for group benefits with employer, even if retired. Check with employers regarding changes that may need to be made to your group insurance policies. Contact labor union about death and survivor's benefits. Check with fraternal organizations about available benefits. Contact American Legion, VFW and similar veterans organizations about available benefits. For memorials given in memory of deceased, forward all funds to appropriate groups. Notify the bank, especially if Social Security benefits are directly deposited. Notify deceased's employer and inquire about 401 (K), pension, profit sharing or similar retirement benefits. Contact your attorney regarding probate of the Estate. If estate is in trust, check with bank's trust department or your attorney. Have your attorney update your will or trust. Update bank accounts, stocks and bonds into your name. Get copies of all bills as soon as possible. We hope you will find this checklist helpful in settling your affairs. Please consult legal counsel. Call all parties before you visit their offices to see which documents they will need. If you give them original copies of documents, ask for a receipt if you need them returned to you. Surround yourself with loving and supportive people. Take care of your body and spirit. Know that you will eventually make this difficult transition. Allow yourself to feel the pain, rather than avoid it. Tears are a natural way to help you heal. It's OK to cry. Grief has no time table. Everyone is unique. Be patient with yourself. Talk about your experience. Ask for help when you need it. Laugh when you need to. For more information and resources for dealing with grief please click here. Planning ahead relieves you of the worry that your family will be burdened with making complicated and difficult decisions while trying to cope with their grief and loss. By talking over your plans in advance, you have an opportunity to discuss a difficult subject openly with your loved one in a non-stressful environment and ensures that your wishes will be carried out just as you would have them - down to the last detail. Pre-funding with insurance protects those funds so they will not count as your asset, if you enter a nursing home. They cannot be withdrawn for any reason prior to the funeral. When you pay for your funeral expenses in advance, your funds grow, reducing the impact of inflation. You can make a single payment or make payments over a period of 3, 5, 7 or 10 years. Should you relocate, or wish to change your funeral provider, your arrangements and funds will follow you. 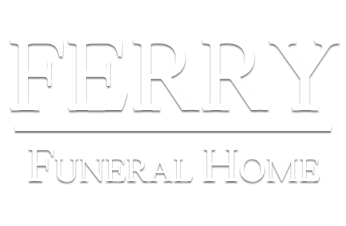 Our staff at Ferry Funeral Home will guide you through the preplanning process. By planning ahead, you have time to make informed and thoughtful decisions. Anyone who has experienced the loss of a loved one knows that the grieving process does not end with the funeral. IN FACT, grief can be most difficult after the funeral, when friends and relatives leave. At this point, you are left to carry on with your life. We want to help you through this most difficult time by providing you with additional services that are available through the funeral home. To print a paper copy of this checklist click here.